HONOLULU – The Hawaii Department of Transportation (HDOT) advises Oahu motorists that the westbound H-1 Freeway will be closed at night in the vicinity of the Radford Drive Overpass and the Kapolei Interchange. See closure details below. Three lanes will be closed (one lane open) in the westbound direction from 9 p.m. to 1 a.m.
Nimitz Highway On-Ramp to the westbound H-1 Freeway will be closed from 1 a.m. to 4 a.m. Single left lane will be closed in the eastbound direction from 7 p.m. to 4 a.m. Motorists traveling on the westbound H-1 Freeway will be directed to Kamehameha Highway as the alternate route. If possible, motorists are encouraged to stay on the Moanalua Freeway to bypass the airport viaduct and the work area. A full closure is necessary to remove the existing variable message board sign at the Radford Drive Overpass. A crane and large vehicles are necessary to lift the sign and place it on a truck to haul away. The project will also require daytime closures on the eastbound H-1 Freeway beginning Monday, March 20, 2017 through Friday, March 24, 2017 in the vicinity of the Radford Drive Overpass from 9 a.m. to 3:30 p.m. 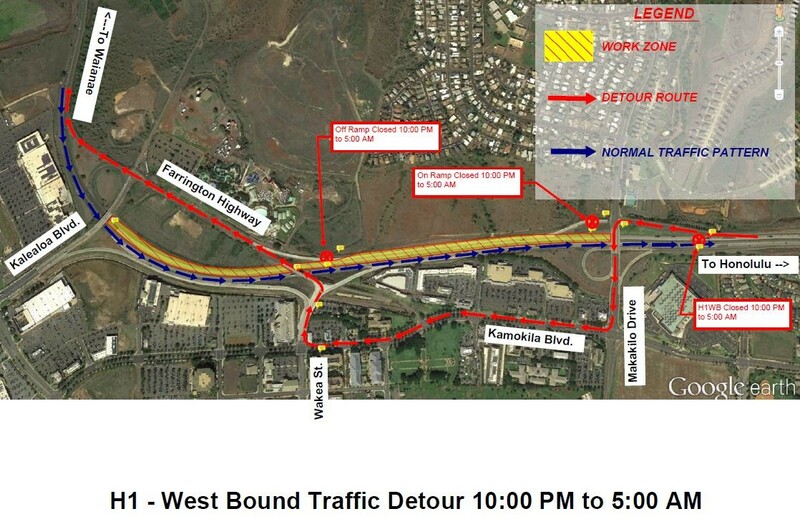 Westbound H-1 Freeway will be closed between the Makakilo Drive Overpass and the Kalaeloa Boulevard Overpass from 10 p.m. to 5 a.m., nightly. HDOT advises motorists to prepare for the closures by checking traffic apps, mapping the best route, and adding extra travel time to their commutes. Electronic message boards will be posted to warn motorists of the closures. Special Duty Police Officers will be on-site to assist with traffic control and safety procedures. Emergency vehicles, first responders and TheBus have been notified of the roadwork and will be allowed through on the H-1 Freeway at the Radford Drive Overpass but will not be allowed through at the Kapolei Interchange due to lifts placed on the freeway. Roadwork is weather permitting.